Exact size. We have specially-manufactured cutting formes to make sure that our CD and DVD sleeves and folders are the exact size to hold your CD or DVD snugly without undesired movement. Choice of formats. From a simple sleeve to a detailed self-mailer with foam studs to accommodate multiple CDs or DVDs, we can provide a full range of formats for your exact requirements. If you need to supply several discs, please call our Design Advice Line on 01457 778788 for free advice and suggestions. Other products. We also design and print CD and DVD labels, duplicate discs, or supply you with labelled blank CDs or DVDs ready for burning. Inlay trays are 150mm x 118mm flat size and designed to fit in a standard Jewel case. They are printed on 150gm gloss art paper and perforated twice. They can be printed single or double sided. CD/DVD sleeves and Inlay Trays are standard rated for VAT. 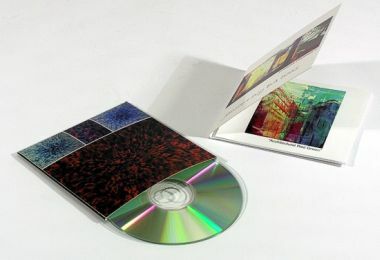 For a template for CD/DVD labels, please see our Labels page.